Rodney Turner thanks God for the Samaritan’s Purse volunteers who helped restore his Houston home as part of our Hurricane Harvey rebuild project. Ever since Hurricane Harvey flooded Rodney Turner’s Houston home with a foot-and-a-half of rainwater almost a year ago, he’s been sleeping on his parents’ living room couch. A coat hook on the back of a door served as his closet. All of his furniture was ruined by the flooding, and flooring and drywall throughout the house needed to be replaced. Rodney Turner in his new kitchen, outfitted with new appliances. Family, friends, and staff join Rodney for a welcome home celebration and prayer time. Carlin Toews, Samaritan's Purse construction supervisor, and our volunteers walk with Rodney through his new home. "I thank God for all these blessings," Rodney said. "I'm ready to come home now." His sister’s home was flooded, too. For weeks after the hurricane, their parents gave 11 friends and family members a place to stay. Earlier this spring, Rodney finally was able to return home. 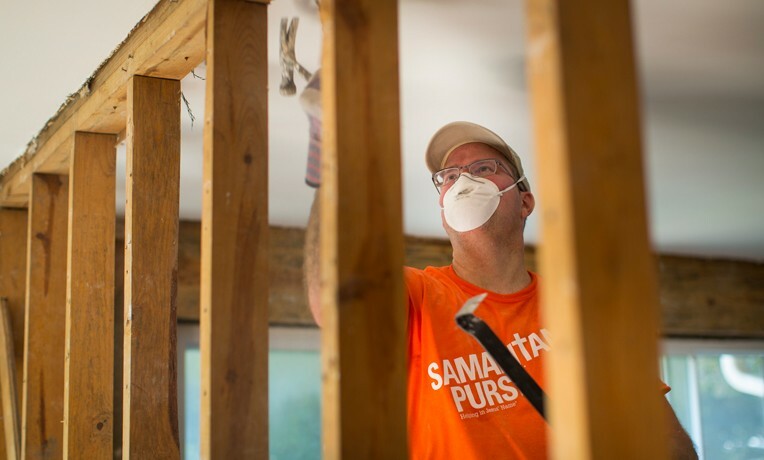 Samaritan’s Purse disaster relief volunteers helped both him and his sister repair their houses. We repaired Rodney’s home as part of our Hurricane Harvey rebuild and recovery project in southeast Texas. Over the course of two to three years (2018-19/20), we’re planning to help 1,000 families get back into their homes (traditional and mobile) and to provide reconstruction grants for 150 or so churches damaged by Hurricane Harvey.